In a few short hours, Northwestern (5-3, 5-1 B1G) will square up against the No. 4 Notre Dame Fighting Irish (8-0) under the lights at Ryan Field. This matchup has everything you could ask for: primetime coverage on ESPN, a rich history, two teams riding 4+ game winning streaks and direct College Football Playoff implications. 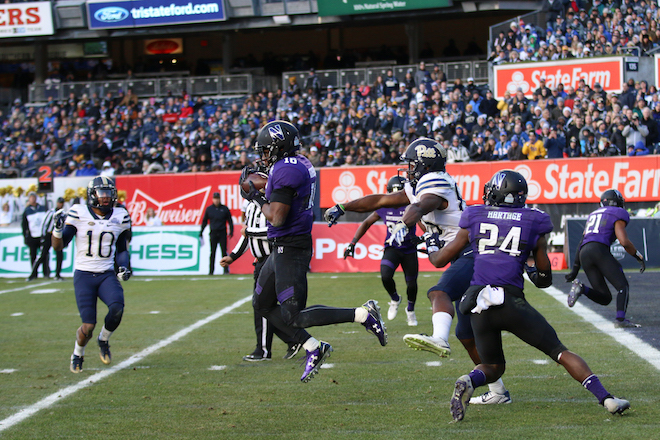 Whereas last week’s win over Wisconsin cemented Northwestern as the team to beat in the Big Ten West, this week is all about whether Northwestern can burst onto the national scene. As we saw after Purdue’s win over Ohio State, one big win can immediately alter the perception of a program and the energy that surrounds it. Notre Dame is among the most talented teams in the nation on both sides of the ball. Northwestern will have to put together an even more complete than they did last week if they seek to shock the college football world. Which Clayton Thorson will we see? The one who threw for for 455 yards and 3 TDs vs. Nebraska, or the one who went 17-34 with 150 yards at Rutgers? The key for Thorson will be limiting turnovers: with 10 interceptions on the season, he is rapidly approaching his career high of 12 with 4 games to go. If Thorson plays turnover-free football and continues to increase his mobility (like he did last week), the Wildcats will have a fighting chance. The Fighting Irish defense is the biggest reason why they are undefeated, and arguably the most prominent member of their defense is 5th-year linebacker Drue Tranquill (47 tackles). Tranquill is questionable for this game with a high ankle sprain, but many expect him to play. If he is out there, look for him and the Front 7 to try to neutralize Isaiah Bowser. This will force Thorson to make 50+ throws, a few under pressure, which they hope will fall in the hands of the secondary. Flynn Nagel (59 receptions, 711 yards) will be the focus for the Irish secondary. 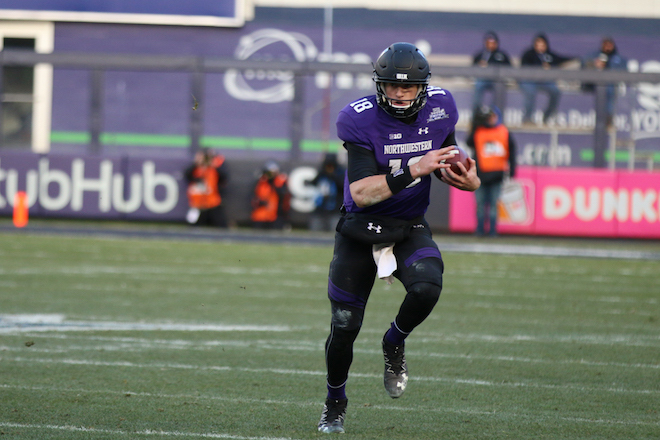 Northwestern hopes that will open up the field for Cameron Green and Ben Skowronek to make big plays like the ones that Northwestern relied on in their win at Michigan State. Overall, the Northwestern offense is ranked 105th in the S&P+ while the Notre Dame defense is ranked 6th. Northwestern’s ranking is deceptively low now that Isaiah Bowser has burst onto the scene and T.J. Green is no longer taking snaps, but the gap is big enough that it will take a small miracle for the Wildcats to win in a shootout. Let’s start with the battle in the trenches. Notre Dame’s offensive line is among the best in the country, and Northwestern only has 12 sacks on the season. What that means is that Ian Book will have plenty of time to find his receivers. The best hope for the Northwestern defense line to have an impact would be Joe Gaziano (4.5 sacks) getting to Brook late in a close game. Everywhere else, though, Northwestern seems to match up well. The defense has given up just over 20 points per game over the last 5 contests, led by Paddy Fisher (61 tackles). Whereas Northwestern will likely rely on the pass, the Irish will probably try to wear down the defense with their running back trio of Dexter Williams, Tony Jones Jr. and Jafar Armstrong, who have a combined 1,135 yards on the year. In the passing game, Montre Hartage (12 deflected passes) has been great will look to lock down either Miles Boykin (36 receptions, 570 yards) or Chase Claypool (28 receptions, 318 yards). The return of linebacker Nate Hall vs. Wisconsin had an immediate impact, as Hall recovered a fumble, and he should play a significant role again. Throw in the fact that Notre Dame tight end Alize Mack is out with a concussion, and it begins to look like the Northwestern defense has a good chance to keep this close.